Martial arts: Embo knows the following hand-to-hand combat techniques. Effect: +2D to the damage of his attack, if Embo’s skill roll exceeds the difficulty. Failure to beat the difficulty number indicates that he is off-balance and his opponent may make an additional attack against him in the same round, with no multiple action penalty. Difficulty: Moderate or opposed Strength roll. Effect: Embo excels at grappling. As long as his attack beats his opponent’s brawling parry or melee parry, Embo’s total needs only to have succeeded vs. the base difficulty of Moderate to hold his opponent. For every round that the target is held, including the round in which the attack is first made, combatants must make an opposed Strength roll. This is a free action, not unlike determining regular brawling damage. If a target beats Embo’s Strength roll, he is able to break free. Difficulty: Difficult or opposed brawling parry or Strength roll. Effect: Embo is known to employ a deadly maneuver wherein he twists and snaps a grappled-opponent’s neck. As long as his target is successfully grappled, Embo may make this second Martial Arts attack and may do so without incurring a multiple action penalty. This attack is rolled vs. his target’s brawling parry or strength, whichever is higher. If Embo’s attack beats his opponent’s roll, while also succeeding against the base difficulty of difficult, then Embo gains a damage bonus equal to the number by which his roll exceeds his target’s roll. For example: if Embo’s “neck-breaker” attack beats his grappled-opponent’s parry or Strength total by 15, while also succeeding against the base difficulty of difficult, then Embo gains a + 15 bonus when rolling for the damage inflicted by this maneuver. If your Gamemaster already uses the optional rule that awards a damage bonus for the degree of skill-roll success, then the damage bonus for this maneuver becomes a cumulative one: the bonus becomes the sum of the success of the skill-roll and the success of the opposed Strength roll which is keeping the target grappled during this round. This isn't my creation. Someone else did this. I just don't recall who did it or where it was posted. I tried searching this forum, but it doesn't appear to be here. Yeah, that someone was me! I did those stats, that’s basically my old write-up, but I guess I got uncredited, along the way. I do also share these on the SWD6 G+ group, and started back in mid-2015. Check the google drink link on page one of this thread and compare my PDF for Embo from 2015. (Some of the first thread comments are about Embo too.) It has those same die codes, uses “Shield-hat” the term, puts beast handling under PER, has command: Anooba, and the lethal strike move has all my signaturely verbose phrasing, etc, etc. So yeah, those are my own previous stats for Embo! Via my initial research back then I started calling Embo’s hat the Kyuzo “Jingasa”, based on its closest RL basis. Since I used a few house rule skill placements the first time around (I originally had “com-scan” combining communications and sensors, brawling in DEX, melee as a combined skill, etc) but yeah, that's basically my old write-up. The version of Embo I just posted incorporates new info however, and I bumped up a few stats -- that are now more accurate, imho. So, if so inclined to replace, I’d say the recent update supersedes that/my previous version! Anyway, all good! The obscure character write-ups are meant for folks to use, so I'm glad my old Embo got around, haha. I do like the character a lot! Hope the update (posted yesterday) to the previous version works out just as well! Thanks to the recent flurry of posts from Shooting Womprats over in the SWD6 G+ group (in particular the Tusken Raider and Ranat posts), I was reminded that I had already-completed write-ups that were yet unshared, and that I had statted up this Tusken Chieftain for the Kenner Sourcebook (along with a non-Kenner Ranat entry to come). So put your hands in the air, again and again... and again, for URoRRuR'R'R! Equipment: Breath mask, customized Tusken Cycler slugthrower rifle (5D damage, range: 10-50/250/500/1km, ammo: 15; Game Notes: Due to its bolt-action mechanism, this weapon must be manually reloaded in order to fire more than once per round. Operating the bolt-action mechanism to reload requires the use of one non-roll combat action), desert robes, Gaderffii (STR+2D damage, Melee Difficulty: Easy), personal Bantha mount: Rrr'ur'R. Capsule: URoRRuR'R'R was an expert marksman and melee combatant whose hunting prowess knew no peer amongst Tuskens of the Jundland Wastes. Yet, those qualities alone were not what earned him leadership of his tribe. Instead, it was his courage when confronted by mechanical horrors that made him clan chieftain. Long ago, URoRRuR'R'R had been so bold as to scavenge a Czerka 6-2Aug2 hunting rifle from the wreckage of a starship that had crashed at Anchorhead. Not only did he return it to a functional state, he managed to make it more deadly and into a truly Tusken weapon, using it to great effect and wielding it proudly like the symbol of prestige and leadership that it was. URoRRuR'R'R once ambushed a young moisture farmer who had dared to enter the Jundland Wastes atop his mechanical steed with a noisy, golden mechanized slave in tow. If not for the untimely approach of a deadly Krayt Dragon, URoRRuR'R'R and his tribe were no doubt on the verge of claiming even more materials that would have been of great use in the hunt. No matter, URoRRuR'R'R feared no metal being. As a result, his tribe of nomads continues to be one of the most feared clans of Tusken Raiders. 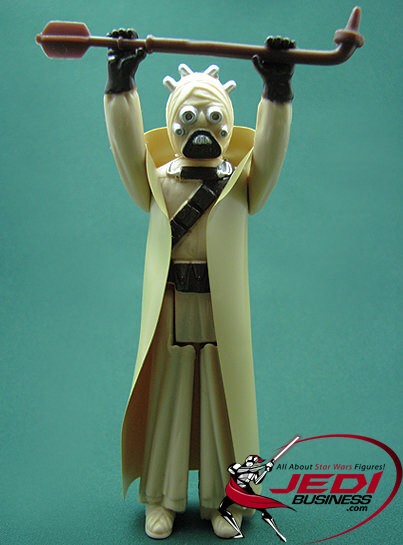 Sources: Tusken Raider (Sand People) Kenner toy packaging, Decipher CCG, Galaxy Guide 1: A New Hope (2E), and Wookieepedia. Stats and capsule text by Telsij. Photo: http://jedibusiness.com . Notes: Character image on vintage Kenner packaging corresponds to the character since identified in Canon/Legends as URoRRuR'R'R. As follow-up to my previous post: from Star Wars: On the Front Lines, with the full text of the "first person" account as told by the Alliance Tunnel Rat himself, here is MUSMURIS REETJEET, along with updated species stats for the RANAT, revised with new canon information! A Quote: "I was there." 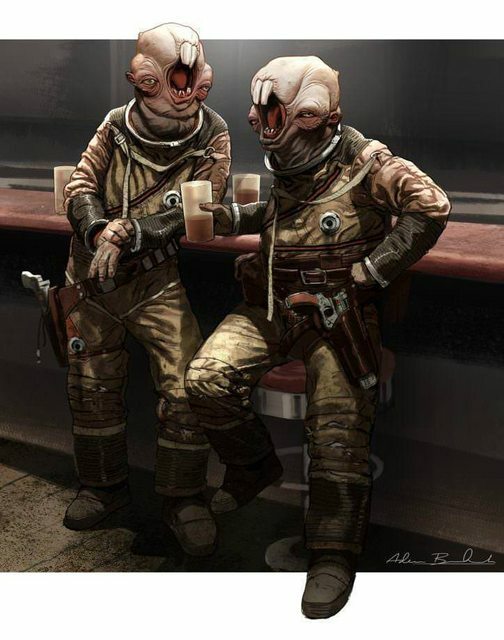 "General Rieekan gave us our orders: infiltrate and capture an Imperial Interdicter. Our target would be the Immobilizer 418 cruiser Glaciate — 600 meters long, armed with twenty laser cannons. And then there's me, a Ranat. No, I hadn't served on an Imperial ship before, are you kidding? Just look at me. But I had the perfect set of skills for this mission and I'd been itching to use them ever since I'd signed up with the Rebels. Until Jakku, no one had ever given me a chance. You'd think me being a Ranat wouldn't matter so much in the New Republic but you'd be wrong. Maybe everybody had had a bad experience with some other Ranat? Maybe everybody was a littlo too quick to judge my small eyes and large incisors? Those eyes can see into the infrared. And those teeth can gnaw through a duracrete plate. Everyone else in my squad was human, all of them ex-Imperials who'd served aboard an Interdictor. Inside a captured Imperial assault shuttle, we made a beeline for Glaciate, praying for protection from TIEs and turbolasers. When we got there we made a hole in the hull just above the engine room. Explosive decompression took care of our opposition. The rest of the Interdictor's crewmembers were too busy with battle to react to our little incursion. We pushed past the drifting bodies and moved into the next room, sealed it, and shed our space suits. I took a deep, satisfied breath. Not being able to smell my surroundings is like going blind. I popped the hatch and crawled inside the systems while the others stood guard. Sniffing the vent ports for ozone and nitric oxide, I traced the reactor governor by its electrostatic discharge and wired in our bypass. The Glaciate sat dead in space. While the others commed Rieekan to tell him of our success, I peered out the porthole down the length of the ship I'd just captured. Promotion, anyone? I like the sound of Captain Reejeet!" Infrared Vision: Provided that there are ambient heat sources present, Ranat can see in darkness with no penalty. Keen Sense of Smell: Ranat have a highly developed sense of smell, and gain a + 1D to search checks when tracking by scent. This bonus may not be improved. Strong Sharp Teeth: Ranat possess extremely strong, sharp teeth whose bite inficts Strength +1D damage. Because of the strong enamel of their incisors, Ranat can chew through many sturdy materials given time, even something as strong as a duracrete plate. In game terms, for every three full rounds that a Ranat devotes to chewing through a given material, he gains a +1D to the damage done, up to a maximum of STR+3D damage. Treat Ranat teeth as having a Body Strength of the character's Strength +3D. Tunneling: Time to use: three rounds. This ability allows the Ranats to use their teeth and claws to gnaw and dig through one meter of solid rock. For stronger or denser materials, adjust the distance accordingly for softer or denser materials). As a general rule of thumb, three additional full rounds of tunneling are required for every +1D increase in the material Strength that a Ranat is attempting to dig through. Discriminated Against: Most sentient species consider the Ranats to be little more that vermin, and are annoyed by the Ranats’ insistence that they are a sentient species. In fact, on many planets, species such as the Ranats may be killed almost with impunity. Technological Learning Curve: Ranats learn primitive skills (non-tool using, non-interactive skills) at 2D for every 1D spent (and one Character Point buys twice as much skill). Ranat may not allot starting dice to most Technical skills (except first aid and security), and Mechanical skills (except beast riding). Underestimated: Many believe the Ranat to be a sub-sentient species, and so those that can use technology and intelligence have the advantage of surprise. Sources: Star Wars: On the Front Lines (by Daniel Wallace) and Wookieepedia. Character Stats and WEG species stat revision by Telsij. Capsule text and image: Star Wars: On The Front Lines (p.115-116). Sources: WEG species stats revised by Telsij, in light of new canon information. Episode I: A Phantom Menace, along with a nod to starwars.com's Willow reference from years ago! Weazel left behind a life as a petty thief to become Enfys Nests' closest lieutenant and most vigilant spy. Having previously worked with the Hutt Cartel out of Mos Espa on Tatooine, Weazel now travels wherever his leader has business, including tracking Beckett's crew to Savareen. Some say Weazel was once an arms dealer, a backstory supported by his facility with ordnance and its deadly applications. Fluent in Huttese and once a fixture on Tatooine, rumors about the diminutive human's past have run the gamut. From a reported reputation for sleaziness in his youth, to a fantastical tale told about his dabbling in dark arts — a fiction that wound up taking on a life of its own, such supplemental stories nonetheless remain unconfirmed, residing in the realm of cantina-spun legends which the Cloud Riders encourage, so as deepen the air of mystery around them: narratives cherry-picked, slanderous or simply self-aggrandizing, and sometimes... even true. Equipment: Cloud Rider armor (+1D vs. physical, +2 vs. energy; covers entire body except head), Kalevalan tracker helmet with rangefinder (+2D vs. physical and energy; covers head only; equipped with internal comlink; On successful sensors roll vs. Easy difficulty, rangefinder adds +2D to search, or to ranged attack skills provided that no other actions except sighting and firing at targets are performed by user that round), Merr-Sonn Munitions K21c portable ordnance launcher (5D damage or 5D grappling; scale: speeder; range: 3-30/100/300 (harpoon rockets' compressed synthrope cables have maximum length of 100 meters); blast radius: 0-3; fire rate: 1; ammo: 1, must be individually / manually reloaded; if scope and shoulder stock with compression gel-filled brace are used for one round of aiming, the character receives a +1D bonus to their missile weapons skill to hit. Game Notes: Tri-barb harpoon rockets grapple with 5D speeder-scale effectiveness, if they successfully hit target. User must affix ordnance launcher to vehicle or structure that is at minimum speeder-scale, in order to lift/pull/redirect larger target. If properly affixed, user may add his vehicle's hull-code to grappling effectiveness. Each additional cable-rocket which successfully grapples a target adds +1D to the effectiveness of any combined action capture attempts), modified swoop bike, utility belt with ammo bandolier (stowage loops hold spare tri-barb harpoon rockets and cables for boarding/capture purposes, as well as standard munitions), two vibrodaggers (STR+2D damage, melee difficulty: Easy). Sources: Solo: A Star Wars Story film, Solo: A Star Wars Story: The Official Guide, Wookieepedia and http://starwars.com Databank. Stats and additional text by Telsij. Opening paragraph of capsule adapted from Solo: A Star Wars Story: The Official Guide (p.116). Image: Star Wars: Card Trader (Card: Weazel). Obscure Character Archive glides in from the treetops of the forest moon for... FLASHBACK FRIDAY? Ok, that works. Flashback to not only his appearance as a burly bruiser who could fell a tree in two strikes on the Ewoks cartoon, but also to his appearance in Caravan of Courage where he was badass enough to pull a Robin-Hood-I-will-OneUp-your-bullseye stunt — but with an axe, chase down a runaway horse on his pony, AND later take on a giant single-handedly! 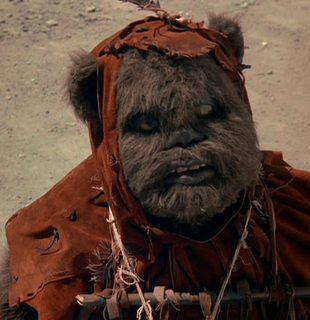 Chukha-Trok was an Ewok woodsman on the forest moon of Endor. Known for his knowledge of the forest and survival lore, Chukha-Trok was a respected figure amongst his people. 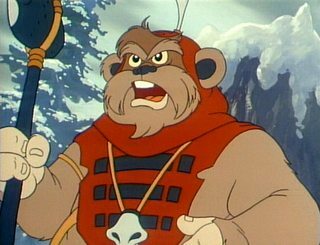 Tall for an Ewok at over a meter in height, with red-brown fur and a muscular, bearish build, Chukha-Trok was also known for his exceptional strength. Serving as both warrior and woodcutter, he acted heroically on behalf of the Ewoks of Bright Tree Village often, and often in quite animated ways. An expert with the stone axe he carried, Chukha-Trok was counted upon by the tribe not only to defend the village from enemy hordes such as the Duloks, but also to tend to the forest surrounding their home. In the latter capacity, Chukha-Trok once cleared a grove of infected trees, thus averting a flood of the village through the creation of a makeshift dam. In his role as warrior, Chukha-Trok fought in several pivotal battles where the fate of the Ewoks on Endor hung in the balance, and he was instrumental in finding the lost Ewok Princess, Asha. Although always willing to aid those in need, Chukha-Trok was sometimes a reluctant hero. When approached by Ewok shaman Logray, to join a quest to save the parents of two stranded human children, Chukha-Trok appeared initially uninterested — even after Logray presented Chukha-Trok with a sacred token to aid them on their journey: the ivory tooth which had been missing from the decorative jawbone the woodcutter wore around his neck. It was only after his martial prowess was challenged that Chukha-Trok agreed to join this Caravan of Courage. Alas, this mission would prove fatal to the Ewok woodcutter. Sacrificing his own life so that the others could escape, Chukha-Trok died after a fierce battle with the mighty Gorax, the monstrous giant who had imprisoned the parents of the Towani children. As a token of their friendship, Chuka-Trok gifted his axe to Mace Towani, before succumbing to the injuries he suffered in single combat against the Gorax. Lumberjack: Chukha-Trok is well-versed in the activity of felling trees using axes, as well as cutting and preparing wood for use in construction. In game terms, if Chukha-Trok succeeds on a Lumberjack skill check, he is able to use his lifting skill in place of his base Strength when determining melee damage rolls that are required to fell a tree or prepare lumber/timber. This benefit may also be combined with bonuses gained from full round preparation, as well as doubling duration of time devoted to a task. And like Tactics, Lumberjack also represents a character's skill in determining how to best make use his knowledge base — in this case, how and what woodcutting techniques or activities may be applicable to a given situation, and how they may be deployed to his best advantage. The skill may be rolled to gain knowledge of how best to fell a tree, where to strike and in what way, how to best respond to unanticipated logging issues or emergencies, and so forth. A Warrior's Pride: Chukha-Trok will never back down from a challenge, especially if said challenge allows him to prove his martial skills to those that may doubt his abilities. Keen Sense of Smell: Ewoks have a highly-developed sense of smell. They gain a +1D bonus to search rolls if tracking by scent. Pre-Spacefaring Society: Before first/extensive contact with the Empire or other travelers with advanced technology, Ewoks lived on the forest moon of Endor in relative isolation, focusing on sorcery and survival. Chukha-Trok and other Ewoks of this era are thus subject to application of the unskilled modifier to the difficulty of using high technology. Typically +5, the modifier may be higher or lower, depending upon the complexity of a given task or item. However, because the Ewoks are an intelligent, sentient species with a sound technical aptitude, this modifier applies only until the character has either received the proper training and gains functional understanding of the item (though he need not necessarily understand the science underpinning that function), or until the Gamemaster deems that a sufficient period of acclimation has passed for the character to adjust to the higher level of technology. Equipment: Animal hide hood with feather, necklace with decorative jawbone, twig-and-twine chest piece, stone axe (STR+1D damage, STR+2D damage if thrown; melee difficulty: Easy; range: 3-5/10/15). Sources: Ewoks: Caravan of Courage telefilm, Ewoks animated series, Wookieepedia and http://starwars.com. Stats and additional/original text by Telsij. Capsule text adapted from archived http://starwars.com databank entry, https://web.archive.org/web/20100209190750/http://starwars.com/databank/character/chukhatrok/index.html and from Wookieepedia. A Quote: "Let me give you some advice. Assume everyone will betray you and you will never be disappointed." Capsule: A grizzled gunslinger, Tobias Beckett was a born survivor, always quietly working out angles and analyzing patterns to ensure that he came out ahead. Even that came at monetary cost however. And so, in order to pay off his debts, this native of Glee Anselm became a professional thief, assembling a team of specialized scoundrels to carry out risky but profitable ventures. Always aware of the uncertainties – and ready to unholster his blasters if something went wrong — Beckett was aware that the latter was always a possibility. Indeed he had learned the hard way that trust has its limits. Nonetheless, Beckett came to be romantically involved with Val, a cool-under-fire saboteur who became a longtime partner in crime. While casing Imperial operations on Mimban, Beckett’s crew encountered a young mudtrooper named Han Solo. Beckett took a liking to Han, and found a place for him and Chewbacca on the Vandor job. The arrival of Enfys Nest’s Cloud-Riders threw the heist into chaos, however, forcing Beckett to make amends with Crimson Dawn, the crime syndicate that had backed his scheme. Beckett, Han and Chewie met with Dawn kingpin Dryden Vos, who agreed to a proposal made by Han: the gang would steal coaxium from the Pyke Syndicate on Kessel. Success would erase Beckett’s debt to Vos – but he knew there were many ways for Han’s risky plan to fail. Sources: Star Wars: A Star Wars Story film and Star Wars: A Star Wars Story: The Official Guide, http://starwars.com Databank, and Wookieepedia. Stats and additional text by Telsij. Capsule text adapted from Star Wars: A Star Wars Story: The Official Guide (p.56-57) and http://starwars.com Databank entry. A Quote: "It's not that kind of game, Han. The object isn't to win, it's just to stay in it as long as you can." Teräs Käsi: A character making a Teräs Käsi attack may not make any other actions in the round, including dodges or parries. The character splits the die code into "attack dice" and "damage dice," rolling only the attack dice to hit, but adding the "damage dice" to the character’s Strength when determining damage. Foot Sweep: Difficulty: Moderate. Effect: A successful attempt indicates the target is tripped, falling to the ground. The character must remain prone for the remainder of the round. Capsule: Despite her youth, Qi’ra is Dryden Vos’s most trusted lieutenant, and an increasingly important Crimson Dawn operative. She has risen far above the bleak conditions of her youth on Corellia, where she lived in the sewers with the notorious White Worms gang. Qi’ra had grown up on Corellia in a notorious Coronet City neighborhood known as the Silo. She soon clawed her way up from the Silo’s wasteland of dangerous streets to become a scrumrat for Lady Proxima’s White Worms, using her cunning to secure a profitable deal for Lady Proxima. Proxima noted her intelligence and initiative, rewarding her with the title of Head Girl. By age 18, Qi’ra commanded the attention and respect of Proxima, if not her full trust. Proxima admired Qi’ra’s scheming and strategy, but recognized a potential threat when she saw one. In the end, Qi’ra’s affection for Han Solo proved to be her undoing. When the couple attempted to flee Corellia using a stolen vial of Coaxium to pay their way, their plan went awry. And although Qi’ra intervened to save Han’s life, she was left behind. But Qi’ra was a survivor. Sold by Proxima to slave trader Sarkin Enneb, she eventually wound up the “property” of crimelord Dryden Voss. After a year of repeated escape attempts, Qi’ra impressed Voss enough for him to offer her a position within the crime syndicate, Crimson Dawn, in exchange for her lifelong loyalty. In time, she rose through the ranks of Crimson Dawn to become Dryden Vos’ most-trusted lieutenant. The two were on Vandor when Qi’ra saw a face from her past: it was Han, seeking an audience with her boss. When Qi’ra was a child, her wary nature had helped her succeed among the Scumrats. Now this quality was teamed with a mature, strategic mind that allowed her to navigate the far more dangerous waters of Crimson Dawn operations. She had thus far managed to conceal her true desires and intentions, using charm and wit to deflect probing questions from Dryden Vos, and from others. Although this cool, calculating front was surprising to Han, Qi’ra was, nonetheless, soon on her way to Kessel with her old flame and his partners in crime — ostensibly to safeguard the interests of Crimson Dawn. 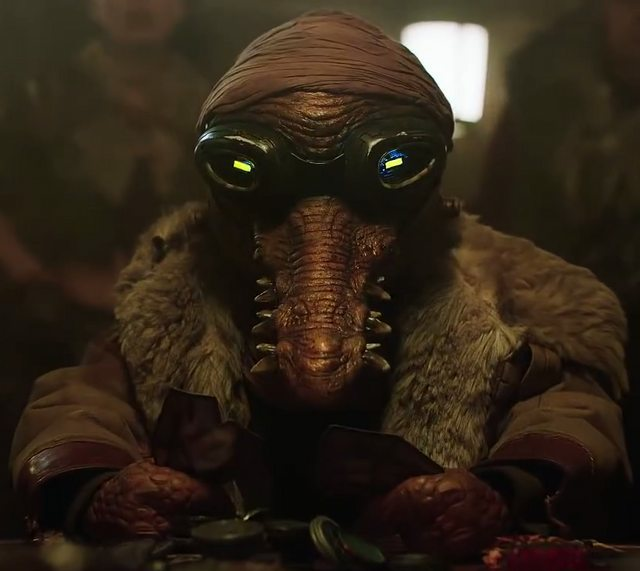 On Kessel, disguised as an emissary from the Federation of Trade Route Allocation and Monetization, Qi'ra helped Beckett’s gang to infiltrate the mining colony and steal the raw coaxium. Her training in hand-to-hand-combat proved useful on the mission, effectively dispatching Quay Tolsite with a move that astounded the self-made droid L3-37. When the Pyke’s prisoners launched a revolt, Qi’ra played an integral role in the battle, launching the explosives that gave her co-conspirators time to board the Millennium Falcon and make their escape. After a daring Kessel Run, which would fuel many years of Han’s boastings, the team made it to the refinery on Savareen just in time to avoid an explosion. Despite Qi’ra’s affinity for her old friend and his heroic impulse to help Enfys Nest by betraying Dryden Vos, Qi’ra’s future was along a different path. In a bloody battle, she turned against her captor, impaling him with his own Kyuzo petar, and assumed control as the public face, figurehead, and “leader” of Crimson Dawn. Equipment: Black evening gown (with color scheme that matches other Syndicate members), Crimson Dawn half-emblem bib necklace, lock-picking spikes (+2D bonus to Security skill checks vs. mechanical/physical locks; set of 6), low-slung holster with loops for ammunition, onyxian belt with gold striping, Monlitzer S-195 double-barreled blaster pistol (see separate entry), moof leather jacket lined with Voorpak fur, reinforced case holding 24 grenades (includes explosives, smoke and sedative gas), vast wardrobe of tailored outfits from galaxy’s leading designers. 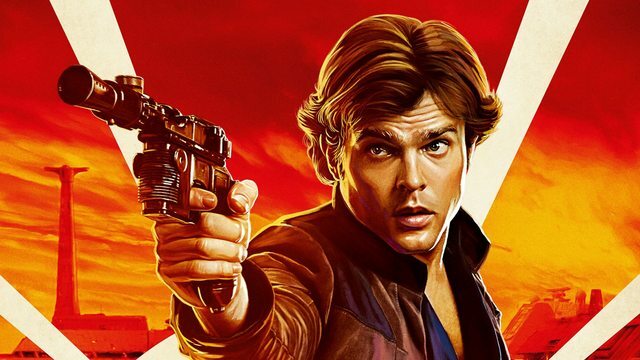 Sources: Solo: A Star Wars Story film and novelization, Solo: A Star Wars Story: The Official Guide, Star Wars: Forces of Destiny episode: “Triplecross”, Wookieepedia, and starwars.com. Stats by Telsij. Capsule text adapted from https://www.starwars.com/databank/qi-ra and Solo: A Star Wars Story: The Official Guide (p.82-83). Image: Revised version of Solo promotional poster by Lucasfilm, likely inspired by the artwork of Hachim Bahous. And now, back to your regularly-scheduled programming! Back "On Brand"
along with GOTARITE species stats. Fear of the “Dark” (+3D): Fugas Fandita is haunted by things he has seen deep in the “Dark” — what veteran miners call the mines. Fugas has seen things in the spice mines of Kessel that make him afraid of ever returning to the planet’s depths. Fugas believes he had seen dangerous, hulking spiders deep in the darkness of the spice mines — armored arachnids attracted to light and motion, that fed on careless miners. Fugas has sworn that he will never again put himself in a situation where he must confront this fear. If Fugas does find himself in such circumstances, the Gotarite will become paralyzed by fear, until the cause of said fear is gone. Released Convict (+1D): As of 10 BBY, Fugas Fandita had recently completed a twelve year prison sentence, toiling in the spice mines of Kessel. After surviving for over a decade in the mines, the Gotarite was released, but must at times still battle the social stigma certain sectors of society place upon ex-convicts. Keen Sense of Smell: A Gotarite gains a +1D bonus to their search rolls, if tracking by scent. Low-Light Vision: A Gotarite is capable of seeing in low-light conditions (short of absolute darkness) without penalty. Mighty Incisors: A Gotarite’s two large front teeth inflict STR+1D damage, if used when brawling. Underground Burrower Heritage: Gotarites’ evolutionary heritage allows them to thrive in underground environments. Not only were their powerful forelimbs developed for digging, their specialized circulatory systems allow them to tolerate higher levels of carbon dioxide than many other mammalian humanoids. In game terms, Gotarites gain a +1D bonus to digging and burrowing-related tasks. In addition, when in enclosed spaces or when the amount of breathable atmosphere is otherwise of concern, Gotarites may re-roll failed breathing-related stamina checks, although they must accept the second result. Capsule: “No matter what species you are, the mines will find a way to do you in. 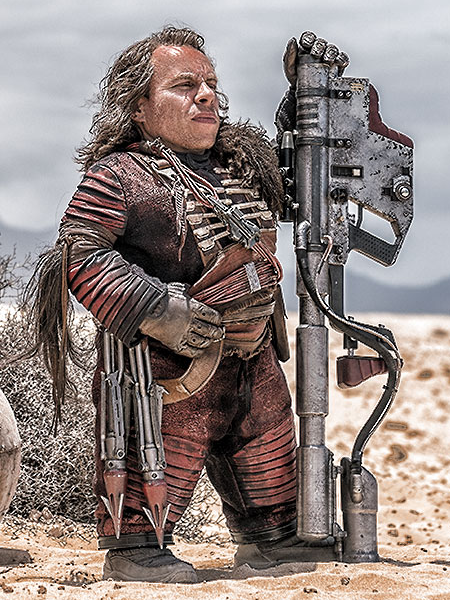 Heavy work gets done by Wookiees, Houks, Gigorans, Yuzzem, and other big bruiser species, but they’ll put, say, a Chadra-Fan or a [sic] Ugnaught to work on more delicate tasks. Droids, too – there’s plenty of jobs for mechanicals, down in the Dark. That’s what the veterans call the mines: the Dark. ‘d been working here a few weeks when an old Gotharite spent all night in the Lodge, picking at a kod’yok steak. His name was Fugas Fandita and he had forearms like airspeeder pistons, hands that looked like stone, and a thousand-parsec stare. Fugas told me he’d just finished a 12-year sentence on Kessel, and the Pykes had offered him a job as a shift boss. Fugas told them no, and was looking to catch on with the Mining Guild instead. When the Pykes make an offer like that, a wise being doesn’t refuse. But Fugas swore he’d never go down in the Dark again. He told me there were things down there that fed on unwary miners. Supposedly they were attracted to light and could sense motion, so the crews shut their helmet lights off and held still when they heard something in the tunnels. But Gotarites have low-light vision, and an excellent sense of smell. So Fugas could still see. He said the hunters in the Dark looked like huge armored spiders, and stank like spice and rotten meat. Equipment: BlasTech RSKF-44 heavy blaster pistol (see separate entry), cup of imitation juri-juice, holster and utility belt, insulated and electro-grounded work coveralls (provides +2D protection vs. effects of severe weather and vs. damage from electrical shock), haul of mined iridium for Mining Guild. Sources: Tales from Vandor book, Solo: A Star Wars Story film, Solo: A Star Wars Story: The Official Guide (p.87), and Wikipedia entry for Mole (animal). Capsule text: Tales from Vandor (pages of book are unnumbered). Stats by Telsij. Sources: Tales from Vandor book, Solo: A Star Wars Story film, Solo: A Star Wars Story: The Official Guide (p.87), and Wikipedia entry for Mole (animal). Awesome, Telsij. I can't wait to see the Solo book! Criminal with a Conscience: Although he has learned harsh lessons about the realities of the underworld by the end of the showdown on Savareen, Han Solo is truly not the ruthless outlaw he aspires to be — and he never will be, despite how convincing his cynical, mercenary veneer becomes over time. At his core, Han Solo is a good man with a good heart, guided by conscience to do the right thing. 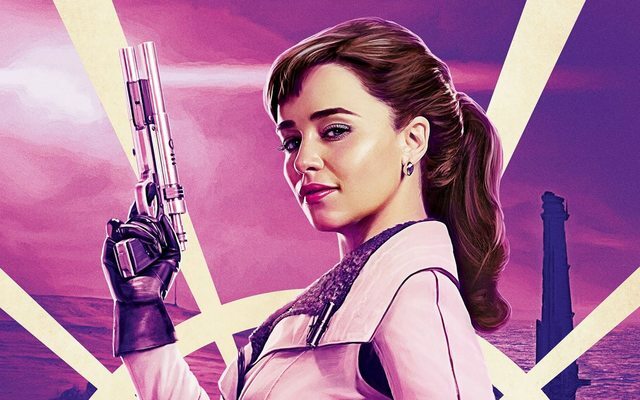 Qi’ra: "Okay, outlaw, you can tell yourself that, but I might be the only person in the whole galaxy who knows what you really are." Han Solo: "Yeah, what’s that?" Qi’ra: "You... are the good guy." Capsule: Times were tough under Imperial rule. Han was a street thief who worked for the notorious White Worms gang, stealing goods and cutting deals on behalf of an ill-tempered crime boss, Lady Proxima. Han doesn’t say much about his past. Although he later speaks of a father who once worked in the Corellian shipyards building CEC starships like the YT-1300 he would one day come to own, he is like many of the urchins crowded in the Corellian slums, a person without a real family, at least not anymore. And so, along with a keen eye for technology, Han’s cockiness, daring and ability to take a punch have made him one of the White Worms’ most capable — if unpredictable — thieves. But budding pilot Han had his sights set on the stars, and he soon improvised an escape from Corellia, hoping to bring his lover and fellow Scrumrat, Qi’ra with him. But their escape went awry, and only Han was able to flee Corellia, acquiring the surname Solo along the way. He entered the Imperial Academy with dreams of becoming the galaxy’s best pilot, while harboring hope of returning to Corellia one day, to save Qi’ra. The traits that made Han an incredible pilot — including a reckless disregard for common sense in favor of trusting his instincts (and secretly kind heart) — work against him in the rigid structure of Imperial, military life. He racked up a checkered record in his short time in the Imperial military. Despite displaying exceptional piloting skills, Solo was drummed out of the academy for one transgression too many — namely breaking formation to save a fellow TIE pilot from Z-95 headhunters. Although outnumbered 4-to-1 by the raiders, and later forced to make an emergency crash landing, Solo saved Onyx 2 — while managing to take out three of the four headhunters single-handedly. Rather than waste the credits already invested in him as a cadet, the Empire transferred him to the infantry. 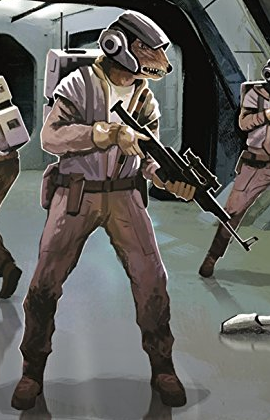 Han wound up on Mimban, fighting for the Empire as a mudtrooper. There, he met the thief Tobias Beckett, whose crew he wound up joining, along with Chewbacca, a Wookiee prisoner whom Han helped escape — and someone who would become his lifelong friend. The gang’s plan to steal coaxium from the Empire on Vandor went awry, leaving them in debt to Dryden Vos, a kingpin with the Crimson Dawn crime syndicate. Han suggested a new scheme: steal unrefined coaxium from Kessel. Needing a fast ship, the gang hired the Millennium Falcon, owned by a dashing rogue named Lando Calrissian. Once inside the mining colony, the plan quickly went awry. Disguised as slaves, Han and Chewbacca infiltrated the lower levels of the mine while Qi'ra and Beckett pursued aggressive negotiations in the offices above. Reunited once L3-37 spurred a revolution of droids and organic slaves alike, the crew managed to escape to the surface with several volatile canisters of raw coaxium, but not without their own casualties — L3-37 among them. In the space above Kessel, the Millennium Falcon was met by an Imperial blockade, an obstacle that inspired the audacious shortcut that would become the foundation of Han’s legendary piloting prowess. Taking the helm of the freighter for the first time, Han set a course through the maelstrom. Ultimately, under Solo’s guidance, the Falcon made the Kessel Run in just about 12 parsecs and touched down at the refinery on Savareen, barely evading a massive explosion at the maw that would have obliterated both the ship and her crew. A surprise run-in with Enfys Nest and the Cloud-Rider gang soon after altered the course of the mission – and Han’s future. No longer content to merely pay off their debt and satisfy a criminal syndicate, Han diverted the coaxium shipment to the fledgling rebellion and was forced to kill his mentor after a brutal double-cross. With only Chewbacca remaining at his side, the pair traveled to Numidian Prime, where Han successfully won the Falcon from Lando in a game of Sabacc and embarked on a career as a smuggler. "I said, next time somebody hits me, I hit them back." Equipment: BlasTech DL-44 heavy blaster (5D damage, range: 3-7/25/50, ammo: 50, game notes: pistol configuration), comlink, driving gloves (+1 to grip when steering) googles, gunslinger’s belt (facilitates quick draw), lucky dice (aurodium-plated chance cubes, used in the Corellian spike variation of Sabacc, where a roll of doubles triggers card shuffles), nerf-leather jacket (with electronically shielded pocket for unprotected data cards and ID storage tag that is kept empty), scuffed engineer’s boots, utility belt. Sources: Solo: A Star Wars Story (film, comic book adaptation, and novelization), Solo: A Star Wars Story: The Official Guide, Wookieepedia, and Tales from Vandor book. Capsule text adapted from starwars.com databank entry, and from Solo: A Star Wars Story: The Official Guide (p16-17, p44). Stats and additional text by Telsij. Image: Lucasfilm promotional poster. Notes: Adjusted his attributes from existing WEG materials, which always gave him 17D+2 rather than 18D. Added that +1 to MEC to better reflect his mech/piloting talents. And in light of his starfighter training (and as relayed in a SOLO deleted scene and the comic adaptation, in order to save a fellow TIE pilot, he broke formation and managed to take out three Z-95 Headhunters in just a TIE — it was initially 4-to-1, one Headhunter survived), I’m giving him starfighter piloting skills on par with Luke in ANH. And at this point, Han has also had formal training under his belt to supplement his formal talent too. On screen in SOLO, Han’s ability seems to be *at least* 7D across the board, imho. Plus no less an expert than Rio explicitly calls him a good pilot, and SOLO print material describes his skills as exceptional already, et cetera. The stats above are still compatible with his existing WEG stats as Han's future projection, just that the new info/characterization bumps up a few stats here and there, and down here and there in comparison to his levels, say, as statted in the Corporate Sector sourcebook. For example, by ANH he has 7D repulsorlift ops. My take is that this (along with his overall starship piloting) was already at a high level and actually stayed relatively static, as he then poured his character points into Falcon/YT-specific and smuggling related skills going forward, etc. And I have him at a relatively high 4 FP, though I think one is spent making sure he gets the first shot off at Beckett and another of those will be spent (selfishly) winning the Falcon! Sunday's Solo-themed OBSCURE CHARACTER ARCHIVE presents: KARJJ and species stats for the CROCIN! Foul Temperament: (+2D) Karjj is prone to distraction and outbursts of anger. In game terms, whenever he is faced with any setback (however minor), Karjj must make a Moderate willpower roll (at minimum, depending upon the situation), in order to resist giving in to his frustration. Failure results in Karjj allowing the setback to affect his current mood. Depending upon the circumstances, this may be expressed as an inability to focus, or an outright loss of temper. Although the character's irritability and foul mood should be roleplayed, to reflect his distracted state in game terms, Karjj also suffers a penalty to his Perception and Perception-based skills for each failed willpower roll, equal to the amount by which he failed the roll. This penalty lasts until his next setback, when a new willpower check will be called for. Debt: (+3D) Karjj has crushing debts that loom large and burdensome in his life. Light Sensitivity: Crocins evolved living in cities built in caverns along the water. Because of this, they are unaccustomed to bright sunlight and must wear protective goggles when travelling off of their homeworld. In game terms, Crocins can see without penalty in low-light conditions, shy of total darkness, but they suffer a -1D penalty to all visually-based tasks in brightly-lit conditions when without protective eyewear. In addition, prolonged exposure to such levels of brightness can cause lasting damage to a Crocin’s eyesight. For every hour that a Crocin is subjected to bright conditions, he must make an Easy Strength check – at minimum, depending how harsh or bright the lighting conditions are. Failed checks indicate that the Crocin suffers ocular damage, with results/effects determined as per standard combat/injury rules. Sawtooth Bite: The Crocin possess rows of sharp saw-like teeth that protrude from the sides of their snouts. These teeth, coupled with their strong jaws, allow Crocins to shred food and other items at very high speeds. In game terms, a Crocin’s teeth inflict STR+2D damage in combat, plus optional grappling effects. And if successful on an initial bite attack, the Crocin may make an immediate, second damage roll against the same target, at no multi-action penalty. Alternatively, after a successful bite attack, if the Crocin wishes to clamp down upon a target, this second roll may be used as the opposed Strength roll to keep a target grappled. The +2D “damage” bonus is then also applied to this opposed Strength roll. Scale-Moisturization: When in arid environments away from their homeworld of Croce, a Crocin must keep his scales from drying out. In game terms, if a Crocin does not administer water or oil to his scales at least once every day, the drying of his scales incurs a -1D penalty to all actions, due to the pain, until he applies oil to his scales. Many Crocins address this issue by using oiled wraps, or other topical measures. Capsule: Bad luck just seems to stick to Karjj. He has a troubled marriage, a clunker of a ship, and crushing debts. It's his foul-tempered, distracted state that makes him a welcome addition to a Sabacc table. He can be counted on to lose his money as quickly as he loses his temper. Despite this, Karjj's love of the game was not diminished by his frequent losses. Equipment: Blaster pistol (4D damage, range: 3-10/30/120, ammo: 100), comlink, modified but dilapidated C-ROC Gozanti-class cruiser (stock stats except: hyperdrive multiplier: x2; space: 4; weapons: double laser cannon, fire arc: front, crew: 1, skill: starship gunnery, fire control: 1D, space range: 1-3/12/25, atmosphere range: 100-300m/1.2km/2.5km, damage: 4D+2; game notes: for every failed roll that uses ship’s systems, a controls ionized result occurs and ship loses −1D from its maneuverability, weapons fire control and damage, and shield dice for remainder of round and the next round), goggles (prevents flash-blinding; calibrated to a Crocin’s specific needs for light reduction/filtration), fur-collared coat (+1D to stamina to resist effects of freezing weather), oiled headwrap (keeps scales from drying out). Sources: Solo: A Star Wars Story film and novelization, Star Wars: Alien Archive book (p.116), Solo-themed Denny's TV commercial, Solo: A Star Wars Story: The Official Guide (p.91), and Wookieepedia. Stats by Telsij. Capsule text adapted from: Solo: A Star Wars Story: The Official Guide (p.91) and Star Wars: Alien Archive (p.116). Crocins are a reptilian species with short bodies, and teeth that protrude from the tops of their mouths. They build their cities in caverns near water, and are unused to bright sunlight. When travelling to warmer climates, they wear protective goggles to prevent damage to their sensitive eyesight. Sources: Solo: A Star Wars Story film and novelization, Star Wars: Alien Archive book (p.116), Solo-themed Denny's TV commercial, Solo: A Star Wars Story: The Official Guide (p.91), and Wookieepedia. Stats by Telsij. Species capsule text: Star Wars: Alien Archive book (p.116). 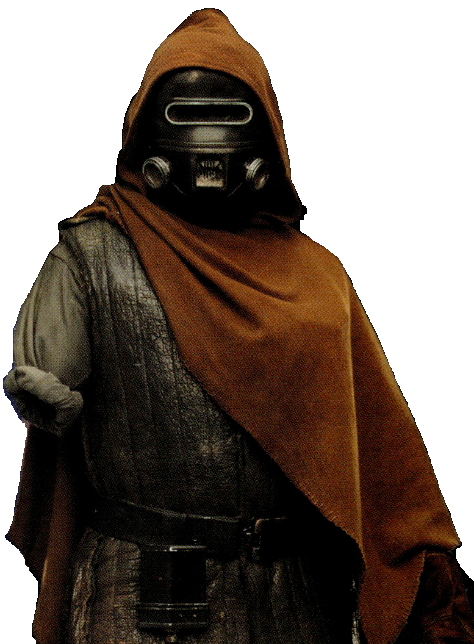 Sunday's themed OBSCURE CHARACTER ARCHIVE entries continue with IOTHENE JACONTRO from Solo: A Star Wars Story and Tales from Vandor. Obsessive-to-a-Fault (+2D): All too often Iothene Jacontro is consumed by his current pursuit. When he becomes fixated on a given quest, objective, target or goal, it comes at the expense of his heath and better judgment, for his fixations often cause him to overlook crucial clues and important information. Lost Limb (+3D): Jacontro has since lost the majority of his right arm to gangrene. In game terms, Jacontro suffers a -1D penalty to his attempts at performing actions that typically involve the use of two hands or two arms. When attempting actions that *require* two hands or arms to perform, Jacontro may make still make an attempt — however, he does so at -1D penalty *and* at one difficulty level higher. In addition, in these cases, his player must conceive of a reasonable alternate method for Jacontro to accomplish this task. (A) Kerestian Darkstick: Time taken: one round. This skill is used to throw and catch the Kerestian darkstick. The character must have thrown weapons of at least 4D to purchase this skill. The darkstick skill begins at the Dexterity attribute (like normal skills). Increase the difficulty to use the darkstick by two levels if the character is not skilled in darkstick. The weapon’s ranges are 5-10/30/50 and the darkstick causes 4D+2 damage. If the character exceeds the difficulty by more than five points, the character can catch the darkstick on its return trip. “There’s a Kerestian hunter named Iothene Jacontro who visits Vandor every year or so. These days Jacontro’s obsessed with tracking down a vastadon that he swears lives up on the Jirree Glacier, but the first time he came to Vandor, he was looking for the treasure — specifically, the fabled Corubalni Hoard. Jacontro showed up with a pack of aliens and told everybody that he’d released wampas into the outback as trophies for a big-game hunt. But the first night — about an hour into my shift — Jacontro’s gang started a fight int the hall with the Valarine School, the meanest bunch of Selkath pirates this side of Eriadu. It went about as well as you’d expect, so the next morning Jacontro came down to find not only an enormous bar bill (and an even bigger bill for damages), but also that half of his gang was dead and the other half was in lockup down the hill. Not the best start to a safari, but it got worse. It generally does, friend. Jacontro needed a new crew, and wound up hiring half of Vandor’s deadbeats, swindlers, liars, and thieves. They they all trooped out of here looking for the Corubalni Hoard. Which I tried to tell them didn’t exist, but Jacontro wasn’t interested in the opinion of an overnight barkeep. We figured that the story about the wampas was just cover for the treasure hunt, at least until Tibbs’ kod’yoks got devoured. Jacontro had released wampas all right, but his people had turned them loose right on the other side of the ridge! While his crew went off hunting for treasure, those ice-creatures followed their noses back to Fort Ypso and started wrecking stuff. So now we had wampas attacking convoys and tearing apart cabins, and nobody to hunt them. Tibbs organized a shooting party, but I decided to sit that one out: I figured I’d stay where it was warm and there was no change something with claws like razors would try to remove my face. While Tibbs and the others were bagging wampas, Jacontro had somehow lost his whole gang without finding any treasure. With one arm nearly frozen solid, Jacontro decided he’d had enough of treasure hunting. But on the trek back to Fort Ypso one of the wampas caught his scent. So as Jacontro was settling his debts, a bull wampa busted right through a wall! Equipment: Blaster rifle (5D damage, range: 3-30/100/300, ammo: 100), climber's mask with oxygen concentrators (provides +1D protection vs. physical and energy damage; allows for normal breathing at high altitude and low oxygen levels), canteen, climbing/survival gear, cloak, hunting traps and paraphernalia, Kerestian darkstick (4D+2 damage, range: 5-10/30/50, increase difficulty by two levels if used unskilled; returns to user if difficulty is exceeded by greater than 5), insulated leather jerkin (grants +2D to stamina rolls vs. effects of freezing temperatures, +1 protection vs. edged physical damage), utility belt. Sources: Solo: A Star Wars Story: The Official Guide (p.86), Tales From Vandor book, and Solo: A Star Wars Story film. Introductory paragraph of capsule text adapted from Solo: A Star Wars Story: The Official Guide (p.86) and subsequent story quoted verbatim from Tales From Vandor (book pages are unnumbered). Stats by Telsij. Image: Solo: A Star Wars Story: The Official Guide (p.86), retouched by Wookieepedia user/uploader.